New Years Eve 2012 was a pretty busy day around McMurdo. I started off by watching (American) football in the lounge of our dorm. Shortly after the Minnesota Vikings finished defeating the Green Bay Packers, JohnE and I went out to Hut Point for a tour of Discovery Hut. Discovery Hut was originally built by Robert F. Scott's Discovery Expedition in 1902. At that time, it was used as an on-shore work and storage area. The hut stays pretty cold all the time, so instead of living in it the Discovery expedition stayed aboard their ship (Discovery), which was frozen in ice in the bay next to McMurdo at the time. The hut was also used by subsequent expeditions headed by Ernest Shackleton (1907-09, 1914-17) and Scott (1910-1913) as a shelter and living space that was much further south than their main headquarters. Inside the hut are stores of food and equipment left behind by these early expeditions. There are also empty boxes left behind that are well-marked and very well preserved. The whole hut smells like hay, for some reason. There is also nearly 100-year-old seal meat and blubber that's been sitting in a corner since the last time the hut was occupied. There are clothes and other pieces of equipment left lying around as well. In general, the hut is basically unchanged since the last party that was using it left in 1917. Access is restricted (only a few people could be inside at a given time) and everything is kept well-preserved by the fact that the temperature never gets above freezing inside the hut. After finishing up the hut tour and checking to see if there were any penguins hanging around (there weren't), we went back in to town. 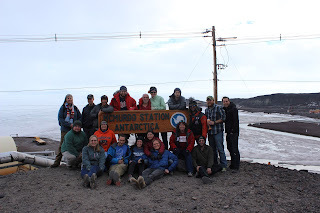 There were about 20 Minnesotans that came out, and we took a few group photos with the McMurdo sign before going in to the lounge of the dorm next door and talking for a bit. Since the Vikings and Packers are facing each other again next week, this time in the playoffs, we made plans to reserve the Coffee House movie theater for the game next Sunday (McMurdo time). It works out really nice that the game is at a time and day that everyone will be free, so it sounds like there will be a decent crowd there. Starting at 4pm, the annual Icestock music festival was held in the space between Building 155 (home to the dining hall and shop) and the gym. They had a wide variety of bands that went up and played music from 4pm until 1am, as well as a couple of smaller temporary buildings where coffee, hot dogs, and (we missed this part) chili from the McMurdo chili cook-off were available. We still had to monitor the payload during our regular 7pm-2am shift, but we did get to be outside at Icestock for the countdown to the new year. It was kind of weird counting down to the new year when everything was so bright outside, but McMurdo got 2013 off to a good start. New Year's Day wasn't particularly exciting. I slept in pretty late and then mostly stayed inside and read for most of the day. With BLAST and EBEX now launched, most of the CSBF crew is leaving McMurdo to head back to the states later this week, leaving only the balloon group monitoring and recovery crews behind.